hole thru which the nerves pass, will visibly get smaller in the case of misalignment on the spinograph. However the only way we can determine if there is any nerve interference or pressure is with the Delta -T or Nervoscope . 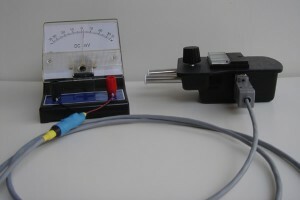 The Delta-T is a temperature differential instrument. It measures heat, which accompanies inflammation However, Gonstead searched for the “thermo-electric block” which caused the nerve pressure. This instrument scans the spine and the doctor looks for the a sharp inflection point which we call the “break.” This break is the point of pressure and interference. Once an adjustment is given, this reading should lower, or return to zero. In this very rare clip, Dr. Gonstead explains that the reading should go to zero if a good adjustment occurs. Advanced instrumentation is the most powerful tool to tell where and if to adjust. It gives immediate feedback if the nerve pressure has been reduced. The instrument is “instrumental” in analysis and correction of subluxations.